Bill Would End Outrageous Loophole Allowing ISIL Fighters to Return to U.S.
Americans who have travelled to foreign countries to train and fight with terror groups such as the Islamic State of Iraq and the Levant (ISIS or ISIL) are not being barred from freely returning to America, where they post a substantial terror threat, according to a leading member of Congress. U.S. intelligence agencies have been tracking Americans who travel abroad to join jihadist groups, but there is no law on the books restricting travel to countries posing a substantial terror threat, according to Rep. Frank Wolf (R., Va.). He is proposing a new law that would significantly restrict travel to Syria and other "nations of concern." Wolf, who originally introduced the bill earlier this year, is leading a new push to pass legislation that would imprison for up to 20 years Americans who travel to these countries following the reported deaths of at least two Americans who had travelled to Syria to fight alongside ISIL. 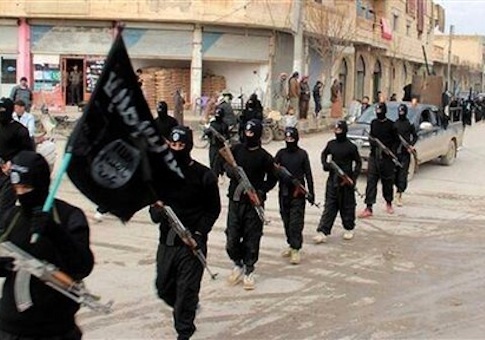 At least 300 Americans are believed to be fighting alongside ISIL, according to U.S. intelligence sources, who have reportedly expressed concern about these fighters returning to carry out terror attacks in America. Wolf petitioned other members of Congress on Thursday to finally "do something to prevent Americans fighting with ISIS from freely returning to the U.S," according to a copy of a letter sent across the Hill. "Limited U.S. intelligence about their activities in the region effectively means our law enforcement can do nothing when they return home, despite concerns about their activities, contacts and training while in Syria," Wolf writes. "I think most would agree we need to do more to prevent these terrorists from returning freely to the U.S."
The United States is not doing enough to prevent radicalized Americans from travelling back-and-forth between countries dominated by Islamist radicals, Wolf said. "The U.S. is not taking any substantial steps to discourage Americans from going over to fight—and these would-be fighters can see there is little price to pay for doing so," the letter states. "This is an untenable situation that puts our country at greater risk of attack from a radicalized American who trains and fights with these groups and later returns home." While U.S. officials have claimed they are tracking suspect Americans abroad, Congressional sources working on the issue say this is "completely unrealistic." "Think of all the FBI resources needed to follow each suspect once they return to the U.S.," the source said. "Countless hours of agent time diverted just to piece together what they were doing over there and how much of a threat they pose back home. Why wouldn't we try to preemptively address it instead?" The security and intelligence gap has already been exploited by radicalized Americans, Wolf warned, referring to the case of Moner Mohammad Abusalha, a Florida resident who was radicalized in Syria and travelled back to the United States to try and recruit his friends and family. Abusalha ultimately fled Florida and returned to Syria, where he carried out a suicide bombing on a government building. "Incredibly, he traveled to and from Syria with impunity—because there are no restrictions on Americans going there," Wolf wrote to other lawmakers. The law as it stands currently takes a passive approach to those who travel between America and countries such as Syria. U.S. authorities do not have the power to detain an American returning from a country like Syria unless there is definitive evidence the individual has joined a terror group. This type of evidence is often difficult to fully secure given the limitations of the U.S. intelligence community, Wolf explained. "Currently, unless the U.S. has solid evidence that they have joined one of these terrorist groups, the FBI can’t detain and arrest suspects upon their return," he wrote. Wolf’s bill, the International Conflicts of Concern Act, seeks to mitigate the terror threat by giving the president authority to restrict travel and material support to nations where radical terror organizations are based. The bill has been endorsed by FBI Director James Comey, who recently discussed the "enormous challenge" of tracking Westerners who travel to nations such as Syria. "So we’re very worried about people who travel there, travel out to the E.U. and then can come to the U.S. without a visa; or our citizens who travel back and forth directly," Comey told the House Appropriations Committee in late March. "I hear about it from all of my colleagues in the E.U. in law enforcement and intelligence. So it's an enormous challenge. And I like very much the idea behind the legislation." Syria continues to be the main country of concern due to the combination of al Qaeda forces, ISIL, and other extremist terror fronts existing there. Numerous reports have been published about Europeans and other Westerners training with these groups before returning to their homelands. "The president could also add additional countries of concern should this conflict spill over into other countries, like we have seen in Iraq," where ISIL also has taken hold, Wolf said. The bill would still permit travel to Syria and similar nations for "humanitarian aid workers, journalists and other groups cleared by the U.S. government." "It’s very hard to track them and very hard to have a conviction," Wolf told the Free Beacon earlier this year. "They’re bringing back the terrorist activity and training." This entry was posted in National Security and tagged Al Qaeda, FBI, Frank Wolf, Islamic State, Syria, Terrorism. Bookmark the permalink.